Bina Sharma, a member of the Melli Dhara Gram Panchayat Unit in the southern part of India’s northeastern Himalayan state of Sikkim, is a relieved woman. As he struggled to find a section of the stream clean enough to rinse off his muddy shoes, Mohan Kumar, a Hindu pilgrim on his way to the holy Amarnath shrine in Indian-administered Kashmir, gazed with despair over the filth that lay thick on the landscape. Rizwana* had hoped and expected that justice would be served – that the man who raped her would be sufficiently punished for his crime. Months after she suffered at his hands, however, the perpetrator remains at large. Rafiqa Kazim and her husband Kazim Ali had a simple dream – to live a modest life, educate their four children and repay the bank-loan that the couple took out to sustain their small business. When Sangan Bhai, a humble man in the Kutch region of India’s western state of Gujarat, was offered a position as an executive member of the local camel breeder’s association, he made a decision that surprised his community: instead of accepting the prestigious post he offered his wife’s name instead. Forty-seven-year-old Shahmala’s husband has been missing since 1993. 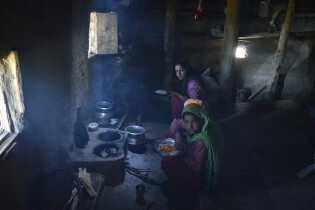 In India’s restive Jammu and Kashmir state, she is what is known as a half-widow, a woman who has no clue whether her husband is dead or alive. Surendar Mohan, a catering assistant at the residential school Jawahar Navodiya Vidyalya, looks thankfully up at the sun from this cold high-altitude desert in northwest India. A vast and picturesque meadow called Tosamaidan, about 112 km west of Jammu and Kashmir’s capital Srinagar, has now become the rallying point for hundreds of villagers who want the artillery exercises being carried out there by the Indian Army to stop. The Ladakh of today is a different world from the one Skarma Namgiyal remembers as a child. Back then, he had taken for granted the breathtaking beauty of its landscape, the purity of the cold mountain air, and the sweet taste of water in its streams. The famed pashmina shawl that keeps the cold away – in style and at a price – could itself have become the victim of winter. Thousands of goats whose fine wool is weaved into pashmina have perished in extreme cold being associated with climate change. Twenty-three-year-old Haleema (not her real name) was not the first female patient at Srinagar’s Chest Diseases Hospital in the Indian state of Kashmir to try to run away. As a little girl, Rubeena Begum had big plans: she would become a doctor and secure a decent income working in one of the 30 hospitals in the Himalayan state of Kashmir in north India. Leaning on her daughter’s arm in the post-operative ward of a hospital in Srinagar, capital of the northern Indian state of Jammu and Kashmir, Raja Begam views the anti-infection pill she is being offered with a large dose of suspicion. Aadil Khan and his two siblings had been playing as usual behind their house in the village of Diver, 110 kilometres north of Kashmir’s capital, Srinagar, when they came across what they thought was a “plaything” laying on the ground. But no sooner had they picked the object up than it literally shattered their innocent lives into pieces.